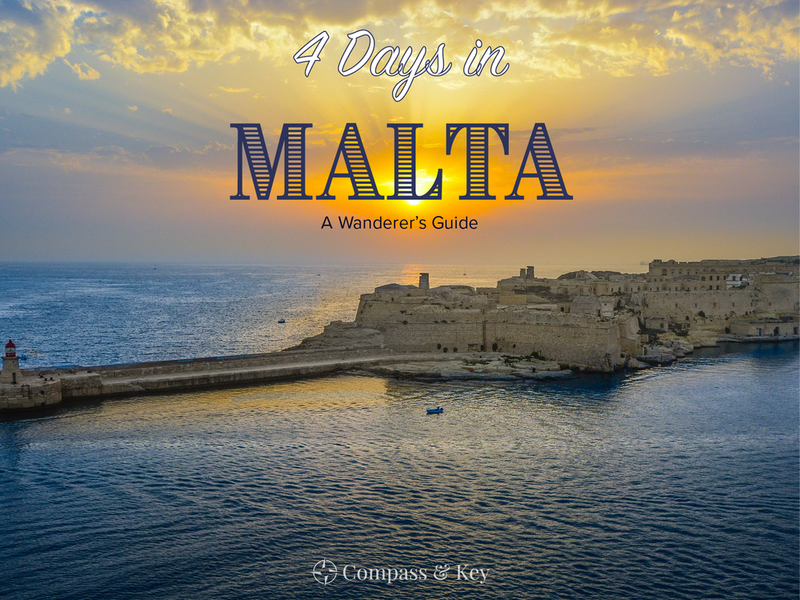 To celebrate the launch of the latest Compass & Key Destination Guide, the Islands of Malta, we've created this 4-day vacation plan to help you discover the very best of this Mediterranean gem. Experience the vibrant capital city, escape to the countryside, and wander some of the oldest archaeological sites in the world, all while leaving plenty of time to bask in the turquoise waters and warm sunshine. Refer to the Essentials section of the destination guide to learn how to travel to Malta and for recommended lodging. To take advantage of an extended weekend, plan to arrive on a Wednesday, explore Malta for four days Thursday through Sunday, then depart on Monday. To include a visit to the prehistoric burial site of Ħal Saflieni Hypogeum recommended for the morning of Day 2, advance booking of timed entry tickets is essential, ideally 4-6 weeks before your trip. Check the Valletta events calendar for theater and exhibition events of interest during your stay, some which may require booking ahead of time. Have your hotel make dinner reservations at our recommended restaurants, particularly during high season (July-September). Most spas require advance notice, so if you're planning on getting pampered, book ahead to avoid disappointment. Reserve the recommended half-day sailing excursion on Day 4 from Gozo, available Wednesdays, Fridays, and Sundays. Forego the alarm and sleep in on your first day, especially if you've traveled a long distance the day prior. After a lazy morning, begin by wandering the cobblestone streets of UNESCO World Heritage Site and Malta's capital city, Valletta. Get your coffee fix at local favorite Culto as you admire the Baroque architecture of the museums and townhomes. Make your way to the Lower Barrakka Gardens to start the Compass & Key walking itinerary, Valletta & Its Knights, but in reverse order. Visit the itinerary page for admission fees, walking times, and to save it to your mobile. It's time for lunch, and what better way to enjoy your first Maltese meal than by grazing the many gourmet food stalls of Is-Suq-Tal-Belt, a Victorian-era covered market that was renovated in early 2018. After sampling the local cuisine, it's a short walk to the Grandmasters Palace, one of the first buildings constructed in newly-formed Valletta by the Knights of St. John, where you can tour the State Rooms and Palace Armory. On to one of Valletta's most popular attractions, the recently refurbished St. John's Co-Cathedral, built in the 16th century to rival the greatest churches in Europe. Make sure to get the audio tour and allow time to appreciate Caravaggio's masterpiece, The Beheading of Saint John. Next, discover Malta's secret tunnel network at the Lascaris War Rooms, and learn how Malta played a critical role in helping Allied Forces during World War II. Exiting the War Rooms at closing time, find the nearby elevator to ascend to the Upper Barrakka Gardens, enjoying spectacular views of Valletta and the Three Cities across the harbor. Return to your hotel to rest and recharge before your evening out. Valletta offers an array of delectable restaurants for dinner. Harbor views can be found on the terrace of Phoenix at the Phoenicia Hotel, or at the Harbour Club below the Barrakka Gardens. Nestled in the historic center of Valletta, try Michael's at the Civil Service Club or family-restaurant Palazzo Preca. As the 2018 European Capital of Culture, make sure to check the Valletta events calendar before your trip to bookmark any art exhibitions or performances during your stay. For vibrant nightlife, you've come to the right place. Find entertainment at the many bars and restaurants throughout Valletta, including live music at Cafe Society and gin cocktails at Yard 32. Travel beyond Valletta to explore the sites and seaside villages of the south coast. If you booked tickets ahead of time, start your day with a guided tour of another UNESCO World Heritage site, Ħal Saflieni Hypogeum, an underground burial complex dating to 4000 BC. From Valletta, take a taxi or one of a number of buses to reach the site. For those seeking more relaxation, enjoy some beach time at St. Thomas Bay near the village of Marsaskala. For lunch, head to Marsaskala to meet friendly locals, away from the crowds of Marsaxlokk. Only an 8-minute walk from St. Thomas Bay beach, or a 15-minute taxi from Ħal Saflieni Hypogeum, Tal-Familja Restaurant is famous for its fresh seafood dishes. Then, walk the shores of Marsaskala Bay to see local fisherman and their colorful boats. Next, we're taking you to a magical walled city in the center of Malta using the Compass & Key walking itinerary, An Evening in Mdina. Start at the ornate Mdina Gates (the fifth stop on the itinerary), built in 1724 by the Knights of St. John and easily recognized by fans of TV show Game of Thrones. Wander the labyrinthine streets past St. Paul's Cathedral and the stately mansions of wealthy residents of Mdina's past and present. Stop at Fontanella Tea Garden for a drink overlooking the Maltese countryside. Visit the itinerary page for admission fees, walking times, and to save it to your mobile. Return to Mdina's city center for dinner at The Medina Restaurant, serving Italian cuisine in a converted Norman home. Enjoy the magical ambiance of the courtyard as you reflect upon your second day in Malta. Check out of your Malta hotel and arrange transport to the Cirkewwa ferry port on the northern part of the island, about an hour taxi ride from Valletta. Once at the port, purchase your roundtrip ticket for the 25-minute Gozo Channel ferry crossing, catching the 10:30 a.m. boat. Upon arrival into Mgarr Harbour on the island of Gozo, hop in a taxi to drop off your suitcases at your hotel. We're expanding our Gozo Hills & History itinerary beyond one day to allow for more exploration. Visit the itinerary page for admission fees, walking times, and to save it to your mobile. You're off to beautiful Xlendi Bay for a relaxing lunch. If you're staying at the Compass & Key recommended Hotel Ta' Cenc, begin your Gozo experience with a 1hr stroll along the cliffs, heading west towards Xlendi Bay. Use this custom AllTrails map we created for the 2.5-mile hike. From other lodgings on the island, arrange for a taxi or plan to take a bus to Xlendi. Once there, head to Ta Karolina restaurant, with its magnificent bayside location and traditional Gozitan specialties. Look inland to see a hilltop castle in the distance, which is our next destination. Its a quick ten-minute drive (via taxi or the 2:09 p.m. bus 306 at the Xmun stop) to Victoria, or Ir-Rabat, Gozo's hilltop capital. Walk to the Citadel, the fortified castle that has served as a refuge since medieval times. Begin with the Citadel Visitors Center, then continue wandering the complex with visits to the Gozo Cathedral, the Old Prisons, and the other onsite museums. From Victoria, a 10-minute drive (via taxi or the 4:05 p.m. bus 307 at the Victoria Bay stop) takes you to UNESCO World Heritage Site, Ggantija Temples. Considered one of the oldest humanmade structures in the world, the remains of these two temples predate the Great Pyramids of Egypt, Stonehenge, and the invention of the wheel. Learn more about the archaeological discoveries at Ggantija at its interpretive center before walking through the site. Head back to your hotel to check-in and relax before dinner. TIP: Ggantija last admission is at 5:30 p.m. Jun-Sep and 4:30 p.m. Oct-May. Enjoy an alfresco dinner under a 400-year old Carob tree at Carubo, one of three onsite restaurants at Hotel Ta' Cenc. Alternatively, end your day in Gozo back in Victoria at one of the local restaurants, including La Stanza, an elegant Italian restaurant in a former farmhouse, or Maldonado, a cozy Mediterranean bistro tucked away on a side street. TIP: Take advantage of Hotel Ta' Cenc's complimentary shuttle to Victoria. After three days of sightseeing, you deserve some time to unwind. Sit poolside at your hotel or pamper yourself with a spa treatment. If you're visiting during high season, Hotel Ta' Cenc offers a shuttle to its private rocky beach along a secluded inlet, ideal for a relaxing morning. A trip to Malta isn't complete without time spent on the water. Sail, swim and snorkel with a half-day sailing excursion, typically running Wednesdays, Fridays, and Sundays from 12-5 p.m. The tour includes visits to the lagoons around Gozo and the neighboring island of Comino. Make sure to check out of your hotel and store your luggage before the excursion. Wave goodbye to Gozo as you head back to Malta on the ferry. Whether you're staying at the same hotel from your first two days, or choosing another recommended hotel for your last night, check-in and relax before your last evening in Malta. Considered one of the finest views in Malta, the terrace at The Chophouse restaurant at Tigne Point overlooks the harbor and Valletta, which shines at night. Reminisce about your favorite Maltese moments over dinner and drinks, choosing from The Chophouse's extensive wine list. Get a good night's sleep before your departure the next day. Click the filter icon in the upper right corner and select "4-Day-Vacation" to see all of the spots featured in this post.